Esther’s unique and colorful artworks surely caught BMW’s attention. In 1991, she’s teamed up with BMW to create an art car as other artists like Andy Warhol, David Hockney, and Frank Stella had done before. But hers is different. 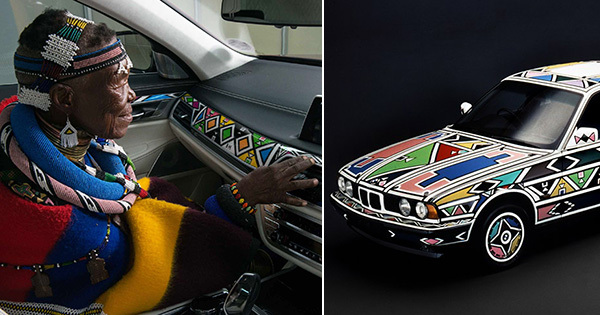 She created the first “African Art Car” from a BMW 525i painted with classic motifs of the Ndebele tribe. “The patterns I have used on the BMW parts marry tradition and to the essence of BMW. When BMW sent me the panels to paint I could see the design in my head and I just wanted to get started … My heart was full of joy when BMW asked me to paint for them again,” Esther said about her second collaboration with BMW.